Permanent cross-functional teams provide an institutional basis for what Hagel and Brown refer to as edge businesses that develop within large-scale enterprises, noting that such companies “should resist the temptation to confront the core, and instead focus on opportunities on the periphery or at the ‘edge’ of their businesses that can scale rapidly.” I suggest below that Dave Gray’s conception of podular organization affords an important insight regarding how the institutional innovation of edge case businesses can develop and organize. By the phrase “business as a whole” Dave means the business purpose defined by the customer’s job to be done. One of the most curious criticisms I’ve heard to the concept of podular design is that its principles do not scale. Admittedly, imagining podular organizing principles for companies that are getting off the ground as startups or, at least, relatively small in size is more straightforward as Kashen observes in a recent post, Flat is the New Up. 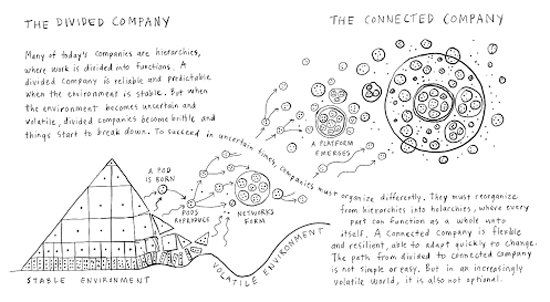 However, aside from the fact that many of the examples of podular design in The Connected Company are rather large organizations, the real insights needing attention relate to the way Dave conceptualizes a podular organization. Regardless of the scale of a podular design, the point is to organize for innovation rather than efficiency. So, let’s consider the hard case for podular organization, i.e. how it applies to large-scale enterprises. if you can find an edge that has the potential to scale extremely rapidly — and given the world we live in scaling happens much more rapidly than ever before — you can actually pull more and more of the core out to the edge, to the point where the new edge over time becomes the core of the business. In our viewpoint thats a much promising approach to change than the original approaches of trying to transform the core. For those needing a visual rendition of how this process works I suggest studying the graphic at the top of this post. Consider an edge business in manufacturing: Recent moves by General Electric and other manufacturers to implement agile manufacturing techniques, what some refer to as the insourcing boom in manufacturing, explicitly recognize the importance of shared experience and collaboration among designers, marketers, engineers, and assembly workers to innovation in products and services. These new factory experiments result from recognition that separating the manufacture of any product, especially durable goods, with electronic components involved makes it more difficult to innovate the product line and adds substantial overhead costs in logistics when producing the product offshore. Shorter product cycles require teams involved in manufacturing to experiment together in designing both the product and the manufacturing process while staying aligned with the business purpose of the organization. Ron Utterbeck, the CIO for GE Corporate and the Advanced Manufacturing Software Technology Center in Michigan characterizes the approach Colab takes to collective intelligence as follows. We can tell that we know Deia’s a communicator because she works in this function. We know that Deia is on this distribution list with Michelle and Mary and Sam, which means a good possibility that Michelle, Mary and Sam have something to do with communications as well. We know who they interact with, and we use that to recommend to people who they should be friends with or follow, if you will…if Mary’s in compliance and she posts something, when I search for documents, for information, on a particular compliance topic, if she posted it and I have access to it and it’s relevant, it’ll come up even though I have no connection to Mary whatsoever. As an example of how such a platform can enable podular organization, consider the way a collaboration network within GE grew, from an experiment in using social software to span geographical boundaries, into a standalone business within GE, a business within a business, or edge business as Hagel and Brown call it. Over the past five years, as proof of concept, Sargent [Steve Sargent, president and CEO of GE Australia and New Zealand] has established a mining-industry network that cuts across GE’s businesses and regions, linking informal teams that use social platforms to collaborate on solving customer needs. GE employees in Brazil, for instance, now work with colleagues in Australia to develop products and services for customers doing business in both countries. The network’s success led the company to elevate it to the status of a full-fledged GE mining business. The one caveat I’d make to Dave’s concept of podular organization is that it would benefit from a more explicit focus on the importance of institutions to the way people in companies approach their work. Dave says companies can design for connection and suggests that doing so increases the organization’s ability to learn and innovate. My main assumption is that collaboration produces better results when the work underlying it includes more than the formal organizational goals, methods, processes, and procedures (guided by the functional rationality of efficiency) that people who work together adhere to in meeting official company goals. Some people might say that this is just a discussion of informal organization. However, conceiving workarounds and exception handling as examples of informal organization doesn’t explain the resource capabilities leveraged by participants to the, essentially institutional, connections that span organizations, such as professional associations, grass-roots activists, business partnerships, governmental regulations, and customer experience. The whole concept of informal organization doesn’t get us very far in understanding what is increasingly becoming a connected ecosystem. I’m simply suggesting that the work practices that afford meaningful, i.e. substantively rational, connections to the business purpose of teams are as much networked and institutional as formally, or informally, organizational in nature at this point. I think Dave’s concept of podular organization brings into focus the importance of substantive rationality. It affords a different perspective on organizational culture when so much of what companies do these days depends on understanding the actions of employees, customers, governments, advocacy groups, and business partners — all with their own take on values, norms, and behavior. This entry was posted on Thursday, May 9th, 2013 at 2:46 pm and is filed under Change Management, Collaboration, Enterprise 2.0, Experience Design, Innovation, Learning Experience, Social Business Design, Social Media, Social Networks, Web 2.0. You can follow any responses to this entry through the RSS 2.0 feed. You can leave a response, or trackback from your own site.